SUGAR LAND, TEXAS (July 11, 2011) The Sugar Land Skeeters is delighted to announce that ‘Coca-Cola’ has become its official pouring rights partner. Among the 10-year agreement elements, Coca-Cola products will be the official beverage of the Skeeters and will be served at all events held at StarTex Power Field. This new 10-year agreement puts all Coca-Cola family of products, including Coke, Diet Coke, Sprite, Dasani Water as well as Minute Maid drinks, in the Sugar Land baseball stadium concession stands, luxury suites, picnic pavilion and clubhouse. Coca-Cola teams with Legends Hospitality, LLC, who last month inked a deal with the Skeeters to handle concessions management, to provide food and beverage for Skeeters fans. Coca-Cola joins a prestigious and growing list of “Founding Partners” that includes StarTex Power, Memorial Hermann, Republic Services, and Texas Direct Auto. HOUSTON, TEXAS (July 11, 2011) Former San Jacinto College (SJC) star Dane Richards has been selected as a member of the class of 2011 National Junior College Athletic Association (NJCAA) Soccer Hall of Fame. The Jamaican born Richards netted 45 goals, a school record, over the course of the 2003 and 2004 seasons at San Jacinto College. In 2004, he was named the National Soccer Coaches Association of America (NSCAA) Junior College Player of the Year, scoring 25 goals while leading his team to third place at the national tournament. “I am honored and excited to be joining the Hall of Fame,” said Richards, now a midfielder with the New York Red Bulls of Major League Soccer (MLS). “When I came to San Jacinto College from Jamaica the summer before the 2003 season, I worked very hard to balance my school work and my playing career, and San Jac was a great place to begin my journey. “Throughout my life, I have always tried to seize every opportunity in front of me and make the best of it, and San Jacinto College allowed me to get started in this game toward my goal of being a professional. I played for two great coaches, Ben Hunter and David Santesteban. Richards was recruited to San Jacinto College by Hunter, who retired after the 2003 season. In 2004, Santesteban took over the program and discovered Richards, a true star player who scored 20 goals as a freshman. Together, Richards and Santesteban got the San Jacinto program back to the national tournament. After his two years at San Jacinto College, Richards moved on to Clemson University, where he led the Tigers to the National Collegiate Athletic Association (NCAA) Division I National Tournament Final Four in 2005. That season, he scored 11 goals and dealt eight assists. 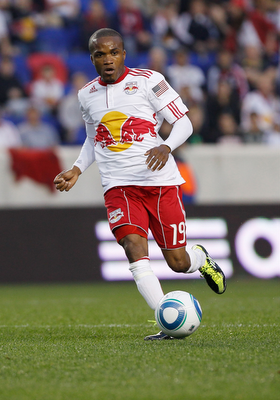 Drafted by the Red Bulls in 2007, Richards has registered 17 goals and 23 assists through four plus seasons in the Big Apple. Richards has also, for several years, been a member of the Jamaican National Team. During the 2011 Confederation of North and Central American and Caribbean Football (CONCACAF) Gold Cup, Richards had a pair of assists in four games for his home country. Santesteban, who nominated Richards for the 2011 Hall of Fame class, is thrilled to see the former San Jacinto College star making a name for himself both in MLS and internationally. Richards is one of eight players and a coach to be inducted into the NJCAA Soccer Hall of Fame class of 2011. The nine inductees will be honored at a banquet in November. HOUSTON, TEXAS (July 9, 2011 )Entering their game against the Toronto FC, the Houston Dynamo had not won a game since June 11 and only two since April 29. On goals by Danny Cruz and Geoff Cameron, they downed a stubborn Toronto team 2-0 in front of 19,085 fans at Robertson Stadium in Houston. Both goals occurred in the second half to raise the Dynamo’s record to 4-6-8 (23 points) while Toronto fell to 3-9-9 (18 points). In the 50th minute, midfielder Danny Cruz got the ball from forward Brian Ching. Cruz then dribbled the ball into the box and fired a shot past goalkeeper Stefan Frei for the first score of the game. The goal was the first of the season for Cruz. The Dynamo increased their margin to two in the 81st minute on an unassisted goal by Geoff Cameron. He got a loose ball in the ball and shot it past Frei for the goal. The Dynamo had other chances for goals, only to be shut out by wide shots, deflections and blocked shots. In the 5th minute, Cruz blasted a shot from outside the 18-yard box, only to have it deflected. The Dynamo continued the attack in the 8th minute when Cruz found midfielder Brad Davis at the edge of the box. Davis fired a shot after two dribbles, but it sailed high and wide of the goal. The Dynamo had six total shots of goal, with Bruin taking two and Cameron, Cruz, Watson and midfielder Colin Clark each with one. Four yellow cards were issued in the game with three going to Toronto and one for the Dynamo to Cruz. Toronto defender Richard Eckersley received one in the 32nd minute for a reckless tackle while forward Alan Gordon was carded for a reckless foul. Midfielder Mikael Yourassowsky was also carded for a reckless tackle in the 68th minute. Cruz’s yellow card was a reckless tackle in the 85th minute. The Dynamo can now breathe a short sigh of relief by putting the game in the win column. However, it must be a short sigh as they must begin Tuesday preparing for their July 16 game against Sporting Kansas City. Sporting KC is currently one place ahead of the Dynamo in the Eastern Conference. The game is set for at 7:30pm CDT in Houston.